Guys, I have a problem. I am addicted to striped shirts. They are literally taking over my closet. Ok, stripes and pink. Apparently I dress like a 12-year-old. But since starting my wardrobe from scratch, I got rid of everything in my closet that 1) I haven’t worn in ages or 2) I wouldn’t wear even if it did fit. Three striped shirts had to go. Cue sad violin. So I gave them a second life by turning them into jewelry. Because garlands and striped shirts are not safe from my need for cute accessories. Plus too-tight T-shirts will definitely fit my wrist – perhaps even make it look skinny (fingers crossed!). 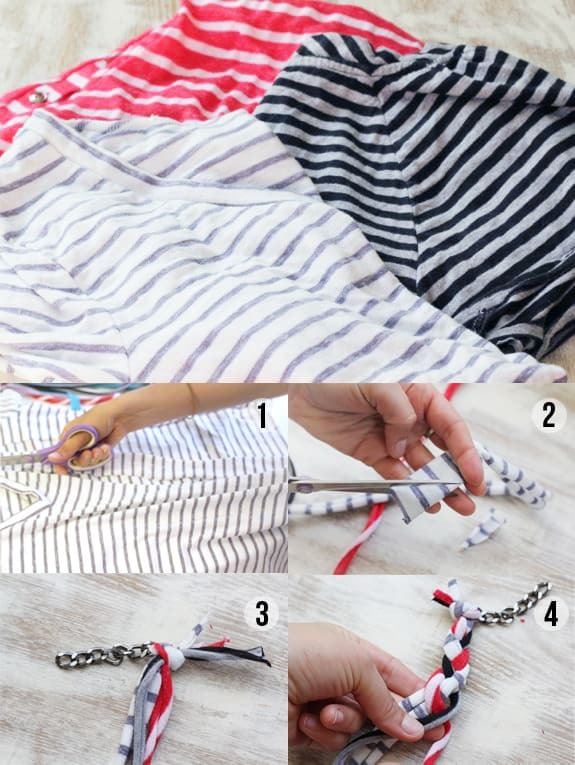 Step 1: Gather your ill fitting T-shirts and enjoy slicing and dicing them. (I highly recommend having a donut while doing this. Not sure why, but it made me feel better.) Cut strips up the front of the shirt for a two loop bracelet. Or cut horizontally if you want more loops. My strips were about an inch wide. After cutting your pieces, give them a stretch. This will lengthen the fabric and make the edges roll inward. Step 2: Pull the three ends through you piece of chain. You might need to cut the edge to make it thinner – this will make it easier to feed the fabric through the chain link. Step 3: Knot the ends. You can keep some of the fabric tail or cut it close to the knot. If you cut it all off, then apply a little glue to the ends. Step 4: Start braiding! Finish by knotting the other side on the chain link. Or wear it as a necklace. Just use a longer piece of chain. I need to pitch almost everything in my closet as well but the problem is that I need to wait until I can afford new clothes! 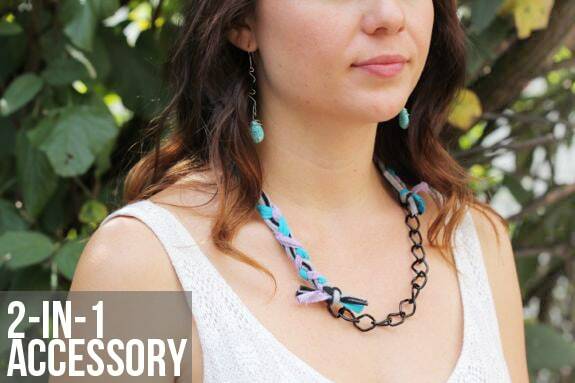 I love that you are using some of your old clothes to make new accessories! Very very cute!! 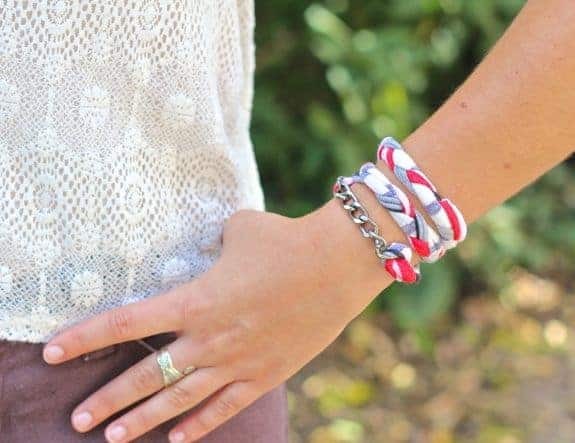 Great DIY, and so simple too! What a clever idea. I always rack my brains for a new use for old things before I throw them ou but I’ve never come up with jewelery. These came out so cute. I’ll definitely try making some out of my old t-shirt scraps. I can never part with old clothes–my closet is a disaster! Maybe if I reuse things, it will make things a little easier. Also, the donut. That will also help. 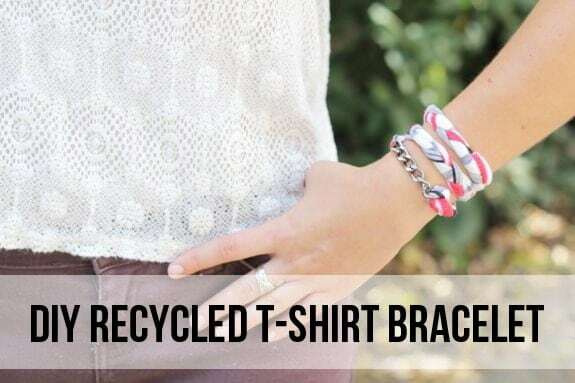 This is such a great way to use all those old t-shirts laying around the house! I love the addition of chain- it looks a little more finished/professional. What a fun, easy DIY. I love this Stephanie! Totally fun:) And lots of possibilities! Cute and simple, my kind of DIY !